The “Berlin Mural Festival” has just wrapped it’s first ever street art festival! Surprisingly this is Berlin’s first mural festival despite being a mecca for urban art and culture over the years. 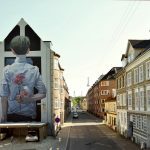 Local and international artists took over twenty-two walls in Berlin’s industrial landscape and turned the city into an open-air contemporary art museum. Artists invited include, MTO, Millo, Herakut, Snik, Case Maclaim, Telmo Miel and James Bullough, One Truth, Natalia-Rak, Notes of Berlin, Mr Woodland, Kollabo Wand, Klebebande, Onur, Wes21, Size two, Nuno Viegas, Tasso, Isakov, Die Dixons, Insane 51, Elle, El Bocho, Ben Wagin, Arsek Erase and AKTEone.